The Gateway Lectures introduce their audience to an important field or topic within medieval and early modern studies. The lectures are designed to be a substantial contribution to research and intellectual community -- while remaining engaging to a general audience. They are delivered by renowned scholars who attempt to make their work accessible and inspirational. 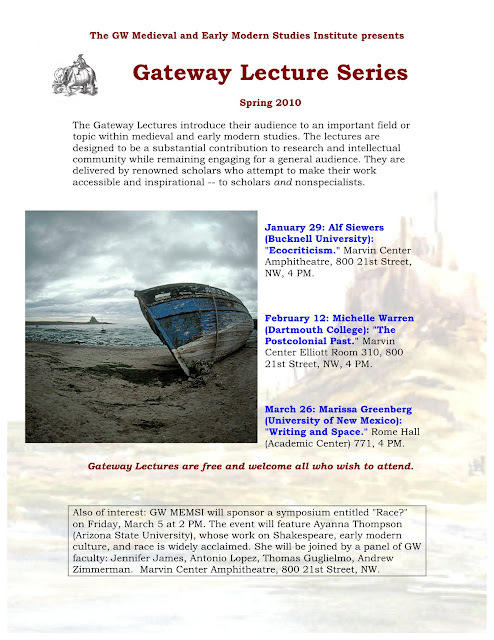 All Gateway lectures are free and welcome all who wish to attend. January 29: Alf Siewers (Bucknell University), "Ecocriticism." Marvin Center Amphitheatre, 800 21st Street, NW, 4 PM. February 12: Michelle Warren (Dartmouth College), "The Postcolonial Past." Marvin Center Elliott Room 310, 800 21st Street, NW, 4 PM. March 26: Marissa Greenberg (University of New Mexico), "Writing and Space." Rome Hall (Academic Center) 771, 4 PM. Also of interest: GW MEMSI will sponsor a symposium entitled "Race?" on Friday, March 5 at 2 PM. 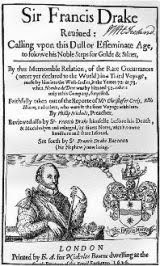 The event will feature Ayanna Thompson (Arizona State University), whose work on Shakespeare, early modern culture, and race is widely acclaimed. She will be joined by a panel of GW faculty: Jennifer James, Antonio Lopez, Thomas Guglielmo, Andrew Zimmerman. Marvin Center Amphitheatre, 800 21st Street, NW. The Department of English at the University of Maryland and the Medieval and Early Modern Studies Institute at George Washington University invite graduate students from across the humanities to submit presentation abstracts for "New Worlds," a one-day conference to be held on April 17, 2010. More information here.